Cast: Naka Riisa, Hayashi Kento, Masuda Takahisa, Oomasa Aya and Ishibashi Anna. This story is about residents becoming doctors, at their very first practice after passing the exams, and their 3 months in Emergency medicine. It follows 5 residents: Miyama Shizuku (Naka Riisa) a strong headed and opinionated lead that believes doctors should do more than just save their patients. 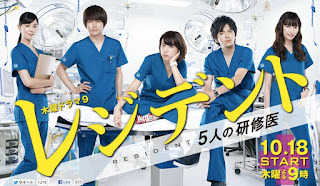 Yazakawa Kei (Hayashi Kento) is top of the bunch with an arrogant attitude, but is most like a doctor. Manaka Junichi (Masuda Takahisa) son of a doctor family that owns a hospital, but different than his family he is over caring and lacks confidence. Koiwa Hinako (Oomasa Aya) who is focused on her looks and prefers not to work too much as it can affect her skin, and is rather selfish. Lastly Shinjo Sachi (Ishibashi Anna) a strict and straightforward girl, who doesn’t like halfhearted or lazy people. I had been waiting for this drama for so long, mainly because of the subbers, not that I blame them for taking so long, but I have wanted to watch it and I finally did. I could not keep my eyes off it as I finished all 10 episodes in one go. The story is good, and yes Masuda is here (my main reason for starting this), but I was head over heels for the love story for the two side characters Shinjo and Yazakawa. Besides it being a serious drama with actual realistic stories, I loved that we saw the real world of the residency. I mean I know residents and interns have it hard, but I was kind of surprised of how small they were and how easy they get blamed for, of course not being deemed responsible, but someone expecting to know how to do things without having any experience is really mean and though. I don’t want to spoil anything, but I am going to say this: a great drama with a realistic view of residency.